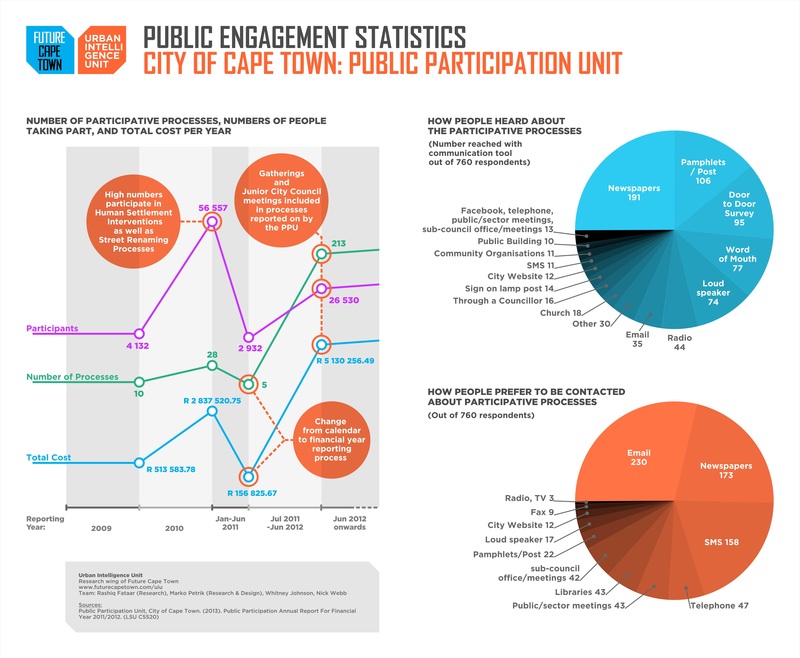 The infographic on Public Engagement Statistics is drawn from the Public Participation Unit in the City of Cape Town‘s Annual Report 2011/2012. The Report aims to present a comparison of the last three year’s data, as well as provide the City with a better idea of how best to engage with its citizenry. 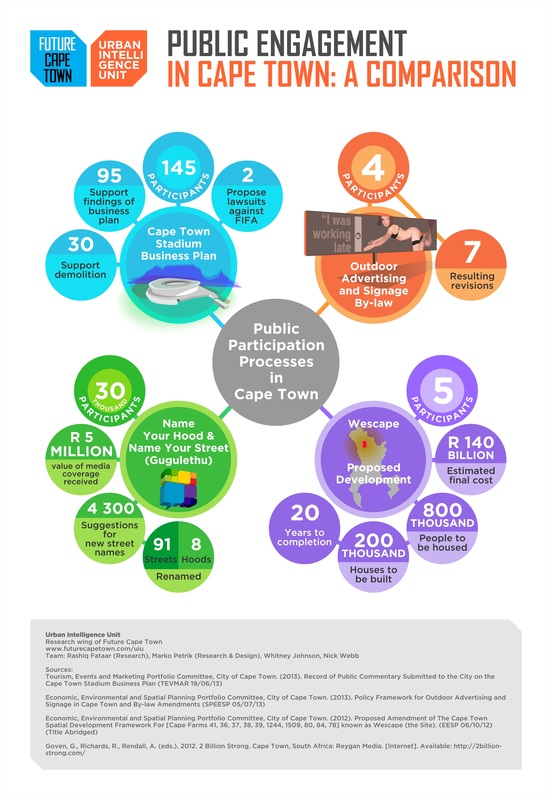 The Comparitive Infographic gives a brief overview of four recent public engagement efforts that were run in the City. It shows that despite the considerable impact on city life and the enormous sums of money at stake, very few people actually review and comment on publicly mooted plans and policies. Considering that Wescape is expected to house 800 000 people as well as considerably re-allocate the resources available to the rest of the Cape (for example: water, electricity,transport maintenance budgets, teachers), the fact that only 5 entities or people commented on the proposal should be a a reason for concern. Should larger development applications, albeit amendments to the urban edge, a deviation from the Cape Town Spatial Development Framework, have a prescribed minimum level of public input? And, is it ethical for leadership to allow such large planning decisions to be made, when the facts and figures show little to no awareness from the public. Secondly, it indicates that the City frequently does make revisions to their plans, based on what people say. Despite low participation, the City did revise the Outdoor Advertising and Signage By-Law, potentially with ramifications to the visual landscape of the city. Finally, there is a clear indication that where engagement efforts are accompanied with good marketing and information (as in the case of Name Your Hood/Street), there is an excellent response from the public, while topical issues which stir public interest like Cape Town Stadium still only result in a moderate level of engagement and response.